The whole campsite team is committed daily in an environment and quality approach. This investment enabled the campsite to attain international labels which recognize and corroborate our quality, respect for the environment and sustainable development. Since Le Paradis campsite was founded 50 years ago, it has been demonstrating its eco-friendliness on a daily basis. Sustainable development was a way of life in this riverside campsite long before the concept became trendy, and it has a certification and an official label to prove it. This campsite in the Vézère Valley in the Dordogne features a covered swimming pool and offers holidays in a natural setting that it is careful to conserve. 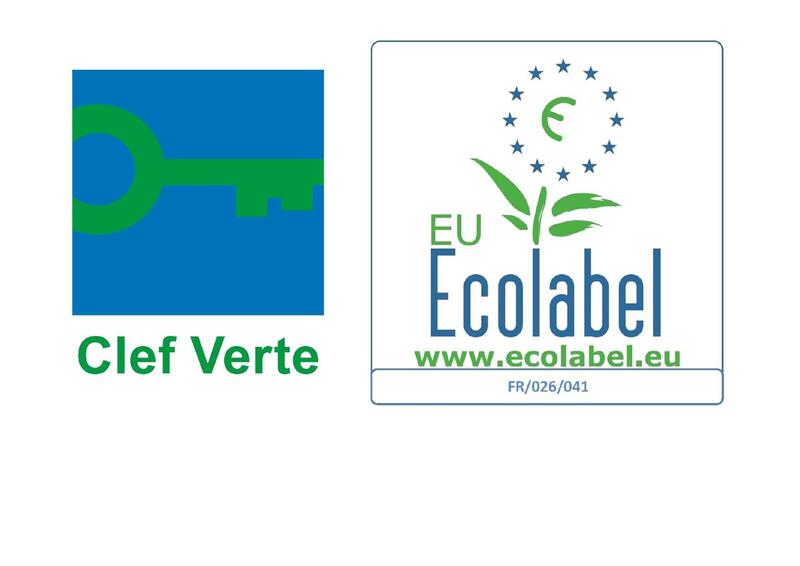 2012 : The campsite obtained the EU Ecolabel, the only official eco-label that is recognised in all the member countries of the European Union. Every certified campsite must comply with strict specifications. Ellen, Gé and the whole campsite team work every day to honour these commitments. After all, this approach is consistent with the conservation of the famous Lascaux caves! Under the sparkling sun, the lush riverbank is a garden of Paradis. Water : Rainwater and stream water are used (to water plants, flush toilets in the sanitary facilities and mobile homes, etc.) water conservation devices are installed on the taps, water softeners are replaced by more eco-friendly systems, leaks are systematically investigated, etc. These commitments are designed to conserve this precious natural resource. Sewage : A reed bed is used as a water treatment system. Energy : 100% of the electricity we use is produced by renewable means (such as solar panels to heat the water). More than 80% of the light bulbs in the campsite are low-energy or LED lights. The light fixtures are equipped with timers. Trash : A sorting zone has been established to achieve the highest possible recycling rate. Green waste is used to make compost. Cleaning : Certified ecological products are used. Observance of laws : Following the environmental regulations is a natural commitment for an eco-friendly campsite. Our local community : Pride of place is given to the purchase of local food products to help support the economy of the Périgord. Our team : All employees have “Ecolabel” training. They are continually kept aware of energy and water conservation, trash sorting, etc. Our suppliers : The restaurant of this Périgord campsite offers dishes principally prepared from fresh local products. Many of these are organically grown. We give pride of place to eco-certified suppliers. Our clients : Le Paradis campsite raises the awareness of its clients on environmental protection with information posters, particularly to remind campers to conserve water in the sanitary facilities. At our high-quality campsite, we do everything we can to help keep the environment healthy: 100% of our rental accommodations and shared areas are non smoking.